When you ask a teacher what they enjoy most about teaching, a large percentage will mention something about the “ah ha” moment when a student understands a concept the teacher has been trying to teach. I have to say that I agree that those moments are very special and there is little else that helps to assure a teacher that they are in the best profession. Those are the moments that make all the hardships of teaching seem worthwhile. I am fortunate to say that I have experienced a great number of these moments, and on several occasions they came at a time when I was frustrated with the other things that take the time of a teacher away from actually teaching students. Those moments helped me remember why I chose to be an educator. As my career progressed and I moved into the realm of school administration, I began to realize that there were other moments that also gave me joy and helped me feel certain that I was doing what I was meant to do in life. I realized how wonderful it is to watch a student who struggles academically achieve success in the athletic arena. That athletic success filled the student with belief that he or she was able to achieve and that hard work and practice can produce results. It was something they could hold onto when the academic struggle felt so difficult. I also found joy when I watched a student read the posted list of names of students who had earned a spot on a particular team or a part in the school drama production and found his or her name listed. Oh, the joy and excitement on that student’s face! It was also special to me to read one of those lists and find the name of a student that I knew was particularly hoping to make that team or be in the production. I couldn’t wait for the student to find his name on the posted list! During my career, I have attended a tremendous number of fine arts events like art shows, choral concerts, and band and orchestra concerts. How joyful it is to see students after the concert who feel so good about their performance that they are smiling from ear to ear, and to be able to tell them how much I had enjoyed the concert. It is equally wonderful to be able to compliment a student on an art project that has been displayed and see that student stand a little taller and smile a little brighter. As a school administrator, I visited many classrooms and observed many teachers involved in the business of educating students. These classroom visits also afforded me moments of joy. It is wonderful to observe a teacher doing an excellent job of instructing students and seeing that teacher feel joy as they watch a student feel that “ah ha” moment. In our current test-driven environment in education, it is also very rewarding as a school administrator to see a teacher feel a sense of accomplishment when her students’ test scores on state mandated tests are as good as or better than she expected them to be. I also experienced joy when a teacher came to show me a project that a student had completed particularly well or to tell me about a student who had excelled on a test or classwork activity after having had difficulty in that class. To see teachers so excited about helping students succeed is amazing. As I have moved into the most recent phase of my career which involves supervising student teachers and facilitating for career switcher teachers, I have again expanded the moments that bring me joy as an educator. When I talk with a student teacher after an observation and point out all of the things the student teacher did well, the attitude of improving confidence in his or her ability as an educator is a wonderful thing to see. It is also great to hear the student teacher or the career switcher teacher tell me about a strategy they tried that worked particularly well or even a lesson they learned after trying a classroom management technique or instructional strategy that didn’t work so well. It is a special joy to be able to observe the growing ability and confidence of these new educators as they gain experience in the classroom. I also still enjoy being there to observe the students who experience the light bulb going on as they grasp a new concept or idea. Their excitement when this happens, and the excitement of the teacher, certainly produce joy for any educator who witnesses these moments. After almost four decades in the field of education, I can certainly create a list of the frustrations of being a classroom teacher or school administrator. The list would be long and sometimes would seem to grow by the minute. That being said, as I reflect on why I continue to work in education, I realize that the many and varied moments of joy far outweigh the frustrations and continue to make me sure that I chose the perfect profession. Education is certainly about instructional strategies and classroom management, but more than that, it is about the people involved in the educational process and the joys of accomplishment they share with me. On days when I was totally frustrated by mandates from the central school administration, or dealing with angry unreasonable parents, or trying to sort out a myriad of administrative issues, I often left my office to visit classrooms. Interacting with students and teachers and experiencing moments of success is a tremendous salve for frustration. It serves as a reminder of why I chose the field of education. It is the moments of joy that I continue to experience that sustain me. Mary Trimmer Robinson graduated from Madison College with a B.A. in English and minors in education and psychology. She received her M.Ed. in Reading from James Madison University and her certification in School Administration and Supervision from Virginia Commonwealth University. During her 35 year tenure in public education, she taught middle school English and reading and high school English, developed and administered an alternative program for overage underachieving middle school students, was a high school administrator and a middle school principal. Mrs. Robinson has been recognized as a Principal of Distinction by the Virginia Department of Education. 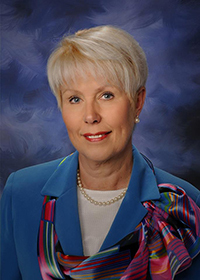 She is a member of several organizations that support education and educational administration. Currently Mrs. Robinson is working as a University Supervisor for student teachers from JMU and the University of Richmond. She is also working in JMU’s Middle Matters program to support career switcher teachers and serves as a Regional Coordinator for the Hanover Cohort of the JMU Educational Leadership Master’s and Certificate Program. In addition, Mrs. Robinson is a member of the Executive Advisory Council for the JMU College of Education and currently serves as the president of this group.